Tap Edit on the Toolbar to display the Edit Bar and enter to Edit mode. Tap the desired folder / document to select, or tap Select all on the Toolbar. Tap and then Delete in the pop-up window if you really want to delete a folder / document. Tap and then select the destination folder. The current position in popup window is shown. Tap to rename folder / document. Tap to export to Library. In popup window select destination folder. Tap on the Toolbar to choose Transfer List. 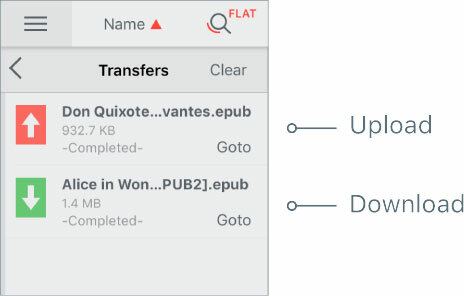 After the download is complete, tap Goto to go to the selected file in the Library. To quickly search for a document in the library activate the filter «New».